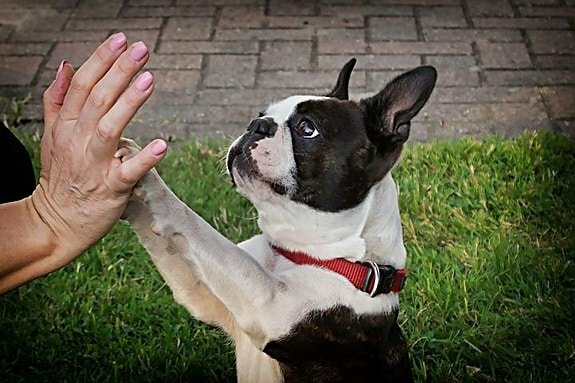 It’s no secret that dogs are loving, sociable animals. They seem to have an endless capacity for affection within their hearts, and that means that they take no pleasure from being left alone with their thoughts. That’s hardly surprising, in many respects. Not only can our furry friends not operate a TV remote with their paws or turn the pages of a doggy newspaper, but they are surrounded by littermates from the moment they are born. Throw in the fact that canines are instinctive pack animals and you have the recipe for a pet that loves company. Unfortunately, this means that owning a dog and working full time can be a challenge. You will need to break separation anxiety quickly when you bring a new puppy into your life, and that will be easier with some breeds than others. 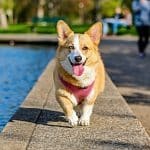 Let’s take a look at what dog breed can typically be left alone for any prolonged period of time, and how you can build a happy life for your pooch around a busy lifestyle. 1 Can a Dog Be Left Alone for 8 Hours? 1.3 What Are the Best Dogs for Single Working Females? 1.4 Can I Leave a Dog Alone for the Weekend? 1.5 How Long Can a Puppy Be Left Alone During the Day? 1.6 How Long Can a Rescue Dog Be Left Alone During the Day? Can a Dog Be Left Alone for 8 Hours? Some dogs can be left alone for up to 8 hours, which is the typical working day. However, as the old saying goes, just because you can it doesn’t mean that you should. The first thing to consider will always be your pet’s bladder. 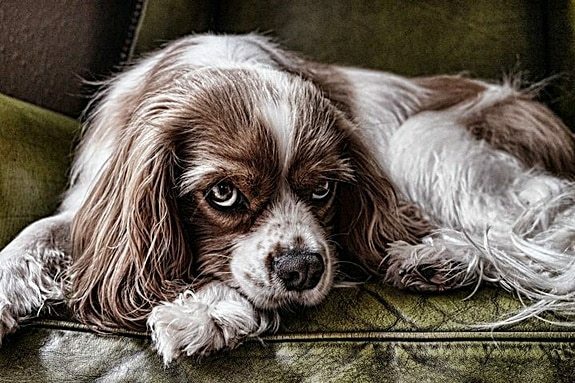 If left alone in an apartment or house for an entire working day with no opportunity to relieve themselves, you may come home and start asking why your dog is peeing on the bed on purpose. A dog can typically hold their water for up to 12 hours, but that’s really an overnight thing while they’re asleep. A dog should be taken outside to relieve themselves at least every 4 or 5 hours. Choose a breed that won’t mind being left alone for this long – more on that in just a moment. Get up early and take your dog for a very long walk before work, and do so again as soon as you get home. This will hopefully leave your dog exhausted enough to sleep away your absence. If at all possible, hire a dog walker that can pick up your dog and take them out for an hour in the middle of the day to break up the experience, and give them a chance to stretch their legs and eliminate. Leave plenty of fresh water and entertainment for your dog, in case they’re restless and can’t sleep. Just to re-iterate though, most dogs will not relish being left alone for such a prolonged period of time whatsoever. If you are unable to accommodate your dog’s needs during your working schedule and are unable to call upon support from friends, family or a professional dog walker, think carefully before introducing a pet to your home. Not all dogs will have a meltdown when they’re left alone in the home, however. Here are some of the best dog breeds for full-time workers. Bassett Hound. These dogs are famously relaxed – and some might say lazy. They’ll be content to crawl onto a cushion and doze the day away. So much so, in fact, that they may not even notice that you have gone while they’re lazing around. Pug. These popular flat-faced breeds are lazy as a rule, and their difficulty breathing means that they won’t want to be charging around all day anyway. They’re typically fine to be left alone all day, but bear in mind that pugs are prone to health problems so it may not be advisable to leave an elderly one alone for prolonged periods of time. Maltese. Among the cutest breeds of dog out there, the Maltese is far from energetic and will be content to sit around and wait for you to get home. Just be aware that they’re quite high maintenance when you do get in, though – a Maltese will need a lot of grooming, and will seek out your attention while you’re home. Beagle. The most popular family dog breed in America can generally be left alone all day – with a huge caveat. These curious critters have bags of energy, so even though they’re not necessarily prone to severe cases of separation anxiety, you’ll need to take them from a serious spot of exercise before leaving them alone to prevent them from getting into mischief in your absence. Greyhound. It may sound strange given their career choice, but greyhounds are hugely lazy animals. The average racing greyhound will retire by the age of 5, and after that, they prefer to spend their days laying around and sleeping. The same could also be said about the greyhound’s cousin, the Whippet. Golden Retriever. Believe it or not, it’s very possible to train these hugely smart large breeds into happily staying at home alone. It’s all about giving your dog a job to do – and, in this case, that means explaining to Fido that he is in charge of guarding and looking after the house until the humans get home. Just be aware, even though these dogs are primarily OK to be left alone it doesn’t mean that you can bring one home and leave them at once. There will still be a prolonged period of training required, and you’ll have to build a sense of trust – especially if the dog is a puppy or a rescue from a shelter. 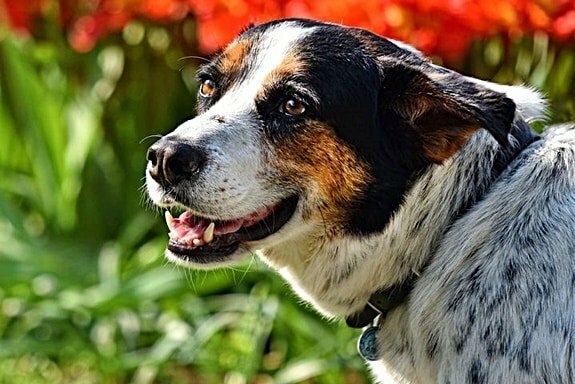 With the right steps, however, you’ll be able to inspire a sense of independence in your canine companion and enjoy time apart as much as your time together. Labrador. These gentle dogs make great family pets, but their sociable nature and high intelligence mean that they will often grow very bored and anxious if left alone for a prolonged period of time. Bichon Frise. These dogs were bred for companionship, which makes them ideal for elderly or unwell people that can’t leave the house too much. A Bichon Frise will typically follow their owner around the house though, so leaving them alone will not end well. Jack Russell Terrier. These little furballs may be small, but they have extremely loud voices – and they won’t be shy about making it heard if they’re bored and lonely. These little dogs need constant stimulation and company to be happy, and will likely drive your neighbors nuts if left alone day. If you go anywhere, make sure that you take them along in a comfy dog carrier for Jack Russells. Border Collie. It’s cruel to leave a Border Collie alone all day, especially if you live in a small apartment. These dogs are very smart and have bags of energy. If they’re not afforded the opportunity to work and run, they will grow incredibly upset and frustrated. Cavalier King Charles Spaniel. This may be one of the most aesthetically pleasing dog breeds in the world, but they’re generally nervous little blighters. This means that they’ll grow very anxious if they’re left alone all day. German Shepherd. The German Shepherd is similar to a Labrador in that they are clever and like to be stimulated, either physically or mentally. Leaving them alone could lead to the destruction of your home, and a whole lot of barking. There are exceptions to every rule. You may be reading this and thinking, I have one of those breeds, and they’re entirely indifferent to being alone.” This may be, and the above is just a guideline. If you are going to introduce a dog to your home, think carefully before making it one of these. What Are the Best Dogs for Single Working Females? Great Dane. These giant breeds are of no use if you live in a small apartment. But, as long as these magnificent canines get at least one long walk a day, they will be perfectly happy to rest and stay quiet the rest of the time. If they do feel the need to raise the alarm and start barking, you should expect everybody from the neighboring five blocks to hear it. Chihuahua. OK, so these little yappers may not be able to battle their way through a fight, but it won’t stop them from trying – pound-for-pound, the Chihuahua is the most aggressive dog breed on the planet. You can also leave your scrappy pooch at home for most of the day, as they’re comparatively independent. English Bulldog. These dogs are great for anybody that lives in an apartment as they are so laid-back that they’re virtually horizontal and won’t tear the house apart in search of stimulation while you’re at work. However, bulldogs are hugely protective of their owners and will sound the alarm if anybody places them under threat. Whether you go for a miniature or regular model, a Schnauzer makes for an excellent watchdog that can be left alone for a while. They’re fantastic watchdogs too, and they’re fiercely loyal – though be aware that a Miniature Schnauzer packs a lot of volume into their bark. Boxer. Boxer dogs are lovers, not fighters, but they look pretty intimidating and are hugely loyal to their owners. This means that if an unwelcome somebody should approach you, they will pull off their best threatening posture. 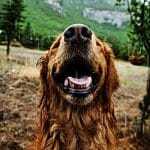 As always, it also depends on the temperament of a particular dog and your living circumstances, but some of the breeds above could make for great companions. Can I Leave a Dog Alone for the Weekend? You really, really shouldn’t. A dog is not like a cat, which will be largely indifferent to being left alone for an entire weekend as long as somebody pops in from time to time and refills their food and water bowls. 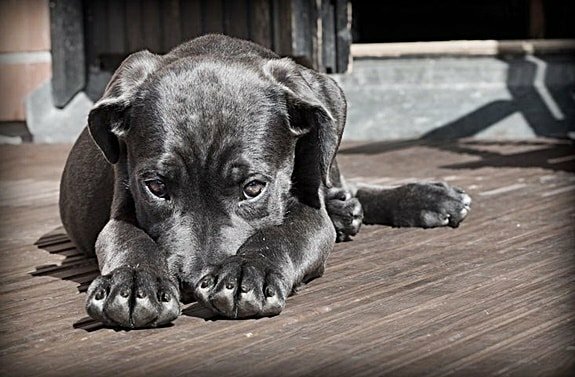 A dog will start to seriously panic if they are left alone for so long, especially when it comes to several overnights, and you may be faced with some serious abandonment issues. In addition to this, your dog could get themselves into all kinds of trouble if left alone and unsupervised for a weekend. Even if somebody pops in once a day to feed them and take them for a stroll, your dog will still be anxious and pace around the house the rest of the time. With nobody on hand to supervise them, who is the say that Fido will not eat something potentially toxic, or have some kind of accident that requires the attention of a vet? If you are going away for a weekend (or longer) and can’t take your dog, leave them with a trusted friend or family member, or book them into a kennel or doggy hotel. This may be an inconvenience, but ultimately it’s all part of the commitment that you took on when you decided to introduce a dog for your family. How Long Can a Puppy Be Left Alone During the Day? Puppies have immature brains and bladders, which means that they should not be left alone for any prolonged period of time, especially for the first six months or so of their life. Once a puppy reaches six months of age, they can usually hold their water for around four hours – and if they’ve been sufficiently exhausted by a long walk or playtime in the morning, they may be content to sleep throughout that time period. After this, you can apply a one-hour-per-month rule; so, a seven-month-old pup can theoretically be left alone for 7 hours, etc. 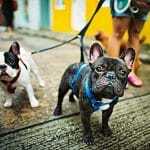 It may be easier to leave a puppy alone if you have another, older dog in the home that gets along with the little critter, as puppies tend to take their cues from a senior-ranking canine. Of course, if your older dog is prone to separation anxiety and howls the house down when you leave that won’t work, as they’ll teach the pup that this is the appropriate response to being left alone. This could still be a pivotal period of your pup’s training, however, so think carefully before you start leaving them alone. Crate training may help in this instance. Just remember that coaching a puppy to cope with being alone is a real balancing act. If you never leave them alone – which would be their preference, as they’re likely to whine and cry when left alone, even if that means leaving the room – they’ll grow over-depending on your company. If you leave them alone too long, too soon, however, you’ll break the bond of trust that is so important to your relationship. How Long Can a Rescue Dog Be Left Alone During the Day? Is the rescue dog housebroken? If they were never toilet trained by a previous owner, you might come home to a variety of accidents. Has the dog been mistreated by a previous owner? Do they trust you to return? If you leave your dog alone for too long, or too soon, before you have gained their complete trust, they may become destructive. 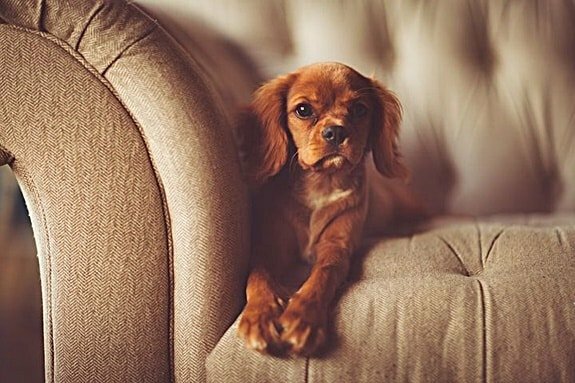 You can follow our advice on how to stop a dog from chewing on furniture when alone, but it’s advisable to ensure that the dog will not have a problem with being alone before you leave for any prolonged period. If you have another dog in the house or even a cat, can you be certain that the two animals get along? A fight between dogs can be a scary and frightening thing, and if you’re not around to put a stop to it sharpish somebody could get hurt. If you’re worried that your dog keeps attacking another dog for no reason, help is at hand – but take it slowly when it comes to leaving your rescue dog home alone. In many respects, bringing a rescue dog into your home should be treated in the same way as a new puppy. Until you have built up a rapport and bond of trust, faith, and welcome behavior, it’s best not to leave them alone. Remember that you can never be certain about the circumstances that your dog may have lived under previously, so they may need some patience and understanding. As we have already established, however, sometimes it’s unavoidable that you’ll need to leave your dog alone. In fact, it’s hugely important that you do so from time to time. Even though nobody wants to deal with the wide, saucer-like puppy dogs eyes from the window when you have the audacity to go to the grocery store alone, not being able to leave a dog by themselves can have a seriously detrimental impact on your quality of life – and over bonding between hounds and humans is a very serious problem. When it comes to leaving dogs alone during the day, try some of the following tips to keep them calm and entertained. Leave some background noise on, so your dog is not quite so struck by the deafening silence. If you leave a talk radio station playing they may snooze, assuming that there is somebody else in the house. It’s also believed that classical music is soothing to dogs, so try that. If you prefer to use the TV, play something with plenty of movement – a sports channel, for example. Your canine chum won’t be interested in tuning into the soaps, but the sudden movement of a ball on a screen will catch their eye. Hide some treats around the house under blankets, beds, etc., so that your dog can go on a little treasure hunt. Be careful that you don’t encourage your dog to go snooping into dangerous places such as kitchen cupboards though, and don’t leave anything tasty near your favorite shoes if Fido is prone to chomping on footwear! Leave some toys around, but nothing plastic that your dog could tear apart and choke on. 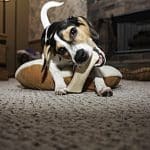 Remember that dogs love to chew for entertainment, so something extremely hard and solid may keep them amused for hours. You could also invest in some doggy puzzles and games that will require your canine to use their wits and brains to obtain treats, but they may need to supervise while they play with these. Best of all, if at all possible hire a dog walker! You’ll be amazed at how much difference it can make to your pet’s day to have some company to break up a long, boring day by themselves, and if your dog walker takes them out for a stroll with a pack of fellow hounds then so much the better. Overall, how long a dog can be left alone is dependent on many different circumstances. It’s always better to err on the side of caution though and strike a happy medium. Never leaving your dog by himself or herself at all can be dangerous to their psychological well being, but abandoning them for hours is equally perilous. Ultimately, you will know best how long your dog can be left alone without starting to grow upset or distressed. Just remember that minutes can feel like hours for a pooch that’s waiting for their beloved human to return, and do whatever you can to make the time apart as bearable as possible for your pet.